Hampi is one of the most beautiful and evocative of all historical sites in south India. It was established as the seat of the Vijayanagara Empire in the mid 14th century, a time when art and architecture flourished. The city was conquered by Sultanate troops in CE 1565, pillaged for six months, and then abandoned. Several travellers from around the world visited the empire during this period and wrote glowing accounts of a magnificent city. Abdul Razzaq, a persian traveller wrote “The City of Vijayanagara is such that the pupil of the eye has never seen a place like it, and the ear of intelligence has never been informed that there existed anything equal it in the world” The world heritage site of Hampi covers 265 square kilometers of area, of which about 17% is considered as the core zone. Within this core zone there are several clusters of monuments in pockets of area. The most important amongst them are the Sacred Center, Royal Center, Islamic quarters, Kamlapura and Anegundi. 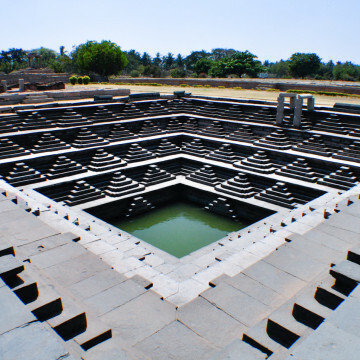 On this tour we explore the rich history of Vijayanagara and renowned architecture styles of Hampi. We will attempt to cover all the important monuments in the Sacred and Royal center areas. In the morning we will first cover the Sacred Center. Sacred Center as the name suggests is the religion center of Hampi, a number of ancient temples and structures are in this area. After lunch we continue our exploration with the Royal Center area. This area was the Citadel of the Vijayanagara kings, it encompasses courtly and military structures of the core zone. We will break for lunch between 12.30 PM to 2.30 PM, a traditional vegetarian lunch will be arranged in Hampi as part of the tour. We continue our exploration of Hampi’s ruins with a tour of Royal City Area and Sunset at Malyavantha Hill for sunset. The following monuments will be covered.